Today we bring you news of two full frame TV series aimed at nostalga fans, both from Network Video and each arrives on 23rd July. First up we have the ravishing Stephanie Beacham in Connie: The Complete Series, arriving as a four disc set, with a running time of 650 minutes and a recommended retail price £39.99. Eight years ago Connie 'retired' to Greece to run a tavern with a local Adonis. Now, her return to her native East Midlands and the industry she loves sends ripples of fear through the dingy offices of her former rivals. Connie wants a slice of the action, but who will give her the all-important toehold? Though she flies back in first-class cabin, Connie gets off the plane in a simple cotton dress, a bandaged hand and clutching a handbag containing nothing but tissues, a lipstick and ten drachma. Things are not all as they seem, and this is a lady who has been wronged, and has now a separate agenda… other than that of a re-start of her career in fashion. 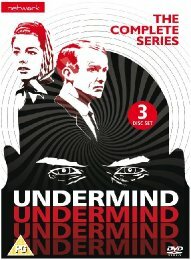 Joining the above is crime drama meets sci-fi series from 1965, Undermind: The Complete Series, co-written by Robert Holmes and starring Rosemary Nicols, Jeremy Kemp and Jeremy Wilkin. With a runtime of 550 minutes, the recommended retail price will be £29.99. Detective Sergeant Frank Heriot is healthy, happily married, and has a good job. So what has made him cold and distant towards his family? And why is he suddenly plagued by terrible headaches? Is he mentally ill or is something far more sinister affecting his mind? Gradually, the answer becomes clear: Frank is the victim of an unknown force seeking to undermine public confidence in the people and institutions that form the backbone of the British Establishment. Doctors, teachers, scientists, clergymen and writers and are all among its targets; its ultimate aim is anarchy. Where will the mysterious menace strike next? It could be the man who sits next to you on the bus. Or it could be you.